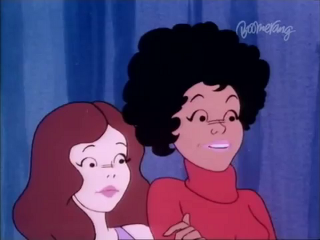 Brenda (left) and Dee Dee (right). “Captain Caveman and the Teen Angels” initially was part of the anthology series “Laff-A-Lympics.” Like most of Hanna-Barbera’s output in the 70s, this was yet another “teens solving mysteries” Scooby-Doo-clone, throwing “Charlie’s Angels” into the mix. The series featured three teenagers called the “Teen Angels,” featuring Dee Dee and her two friends: Taffy Dare, a blonde Farrah Fawcett lookalike (voiced by Laurel Page); and Brenda Chance, the cowardly “Shaggy” of the group (voiced by the late Marilyn Schreffler). Finally, of course, was the obligatory wacky Scooby-style sidekick. In this case, Captain Caveman himself (voiced by Mel Blanc). Cavey (as Cap was nicknamed) was the “world’s first superhero.” He’s a caveman from prehistoric times thawed from a block of ice found by the Teen Angels. Cavey stayed in a miniature cave on top of the van the Angels used to drive around the country. All of them would solve various mysteries in each episode. The villain always, as with “Scooby Doo,” was just someone in a costume. This is of the few pre-1980s cartoon series mainly starring female protagonists, aside from Cavey’s top-billing. While Captain Caveman was the one who usually captured the villain at the episode’s end, it was the Angels who actually solved the mysteries in question. It’s also one of the few older cartoons to feature a female leader of a group. The Teen Angels’ leader is pretty much Taffy (who came up with the villain traps) or Dee Dee. Similar to Valerie on “Josie and the Pussycats,” Dee Dee was usually shown as the “brains” of the group. She often was the one who helped the most in figuring out the clues. Since the 1980s, Dee Dee and her fellow Teen Angels have remained largely unseen, save one or two comic book spinoff appearances. Cavey stuck around through the 1980s, retconned into the Flintstones’ time-era as Bedrock’s resident superhero.